Yuliya Nesterenko  (alt. spelling: Yulia Nestsiarenka, née Bartsevich (Belarusian : Юлія Несцярэнка, Julija Nieściarenka; Russian : Юлия Нестеренко, Yuliya Nesterenko; born 15 June 1979) is a Belarusian sprinter. 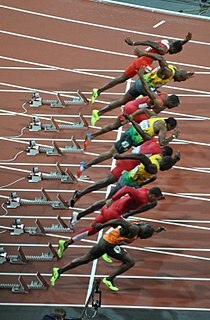 The 100 metres, or 100 metre dash, is a sprint race in track and field competitions. The shortest common outdoor running distance, it is one of the most popular and prestigious events in the sport of athletics. It has been contested at the Summer Olympics since 1896 for men and since 1928 for women. After the Olympic games in Athens she took an almost year-long break. At the 2005 World Championships in Athletics in Helsinki she reached the final in the 100 metres, though came only 8th (11.13 seconds). She won a bronze medal in another event, the 4 × 100 metres relay, together with her compatriots Natallia Solohub, Alena Neumiarzhitskaya and Aksana Drahun. At the 2006 European Athletics Championships in Gothenburg she was 6th in the 100m final and won a bronze medal in the 4 × 100 m relay. Kim Gevaert is a former sprint athlete and Olympic champion from Belgium. Aksana Drahun, a.k.a. Oksana Dragun, is a Belarusian sprinter, who specializes in the 100 metres. Her personal best time is 11.28 seconds, achieved in July 2005 in Minsk. Nesterenko is a member of the Belarus Olympic Committee. The National Olympic Committee of the Republic of Belarus is one of many national Olympic committees that make up the International Olympic Committee. Created in 1991, the NOC RB, is charged with selecting athletes to represent Belarus in the Summer and Winter Olympic Games, enforcing anti-doping laws and promote sporting activity inside Belarus. The current president of the NOC RB is Alexander Lukashenko, the current President of Belarus. The women's 100 metres at the 2004 Summer Olympics as part of the athletics program were held at the Athens Olympic Stadium from August 20 to 21. The women's 4×100 metres relay at the 2004 Summer Olympics as part of the athletics program was held at the Athens Olympic Stadium from August 26 to 27. The sixteen teams competed in a two-heat qualifying round in which the first three teams from each heat, together with the next two fastest teams, were given a place in the final race. Belarus competed at the 2004 Summer Olympics in Athens, Greece, from 13 to 29 August 2004. This was the nation's fifth appearance at the Summer Olympics in the post-Soviet era. The Belarus Olympic Committee sent a total of 151 athletes to the Games, 82 men and 69 women, to compete in 22 sports. Ivet Miroslavova Lalova-Collio is a Bulgarian athlete who specialises in the 100 metres and 200 metres sprint events. She is the 12th-fastest woman in the history of the 100 metres and is tied with Irina Privalova for the fastest time by a sprinter not of West African descent. She finished fourth in the 100 metres and fifth in the 200 metres at the 2004 Summer Olympics. Her career was interrupted for two years between June 2005 and May 2007 due to a leg injury. In June 2012 she won gold at the 2012 European Athletics Championships in the Women's 100 metres. In July 2016 she won two silver medals at the 2016 European Athletics Championships in both the Women's 100 and 200 metres. She participated at four editions of the Olympic Games. Alena Neumiarzhitskaya is a Belarusian sprinter. Muna Lee is an American sprinter. Lee ran track collegiately at Louisiana State University. Lee was a seven-time NCAA champion, 12-time SEC champion and 20-time All-American with the Lady Tigers from 2001-04. Tobias Benjamin Unger is a retired German track and field athlete who competed in sprints. Oludamola Bolanle ("Damola") Osayomi is a Nigerian sprinter who specializes in the 100 metres and 200 metres. She is a four-time gold medallist at the African Championships in Athletics and won an Olympic silver medal with Nigeria in the 4×100 metres relay at the 2008 Beijing Olympics. She also won the 100 and 200 m sprints at the 2007 All-Africa Games. Élodie Ouédraogo is a retired Belgian sprinter of Burkinabé descent, who specializes in the 200 metres and 400 m hurdles. An Olympic gold medalist, her personal best time in the 200 m is 23.11 seconds, achieved in July 2004 in Brussels, while her personal best in the 400 m hurdles is 55.20, achieved at the 2012 Summer Olympics. Ouédraogo is also the joint third-fastest Belgian woman after Kim Gevaert and Olivia Borlée and equalling Nancy Callaerts with her best 100 metres time of 11.40. Her 200 metres best ranks her fourth amongst Belgian women after Gevaert, Borlée and Hanna Mariën. Her 400 m hurdles best places her as the second-fastest Belgian woman over the distance, after Ann Mercken. Hanna Emilie Mariën is a retired Belgian sprinter who specialized in the 200 metres. The British Virgin Islands took part in the 2008 Summer Olympics, which were held in Beijing, China from 8 to 24 August 2008. The dependency's participation at Beijing marked its seventh consecutive appearance in the summer Olympics since its debut in 1984, and its eighth Olympic appearance ever. The British Virgin Islander delegation included two athletes in 2008 participating in two distinct events in one sport: discus thrower Eric Matthias and sprinter Tahesia Harrigan. Of the athletes, Harrigan was the flagbearer and the first female Olympian to participate on behalf of the British Virgin Islands in its entire history. Overall, Harrigan advanced to quarterfinals in her event, although neither athlete medaled. Aleksandra Andreyevna Fedoriva is a Russian track and field athlete who competes mainly in sprinting events. Yuliya Igorevna Chermoshanskaya is a Russian track and field athlete. She competed at the 2008 Summer Olympics in the 4x100 metres relay. She is the daughter of former sprinter Galina Malchugina. Rosângela Cristina Oliveira Santos is an American born track and field sprint athlete who competes internationally for Brazil. Nastassia Shuliak is a track and field sprint athlete who competes internationally for Belarus. Hanna Bahdanovich, also transliterated as Anna Bagdanovich, is a track and field sprint athlete who competes internationally for Belarus. ↑ "Yuliya NESTERENKO – Profile". iaaf.org. Retrieved 2019-01-30.